Increase mindshare + marketshare via customer-focused, marketing strategy driven product innovation. Whether you are an SMB / small business firm or a large global company, to support the 3 pillars of your online marketing strategy (which shape and direct your web marketing tactics), you need to build a strong foundation that is your product innovation strategy. As we focus on helping you achieve that worthwhile goal, our preference and MO has been to dissect jargon and hype to cut to the essence of strategic marketing concepts. To help you apply fundamental yet powerful ideas + frameworks that have the proven power to enhance your product innovation & marketing efforts – helping your company achieve market traction and growth. In short, this page outlines how strategic product management 101 can lead you to market-winning product innovations. What is the role of product strategy? What value does it provide? What are the critical elements of a product innovation strategy? How does a strategic view stimulate product innovation & adoption? Is there a need for Product Strategy? Why do successful companies invest in Strategic Product Management in addition to their product development / manufacturing resources? The simple answer is that, quite often, companies small to large, embark on launching a product for the market simply because they have thought of a need and figured out a way to create that product. That is, they have solved a design or technical/engineering challenge and have the resources to manufacture and distribute the manufactured item. So, what is the problem? The issue is that in the excitement of discovery and (especially in Silicon Valley software companies and those following in their footsteps), the thrill of getting into the technical details of manufacturing the product, some things tend to get forgotten or barely remembered. What gets overlooked (or not adequately emphasized) is the view from the target user / target customer perspective – which determines the market potential. Put simply, the uncomfortable question often unasked is – do prospective buyers feel the same level of excitement and optimism about your new or upgraded product that you do? 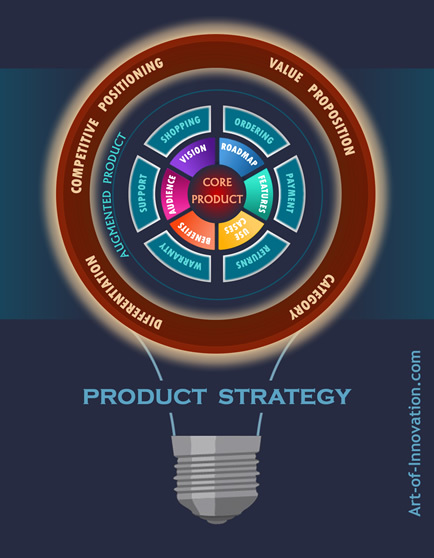 Viewed another way, each of the elements / concepts noted in the infographic above represents a focus area for brainstorming, innovation, and product improvement. All products (maybe not the ones you create for others as charity, or those for yourself and your friends as a hobby!) need to attain commercial viability – and for that, they have to solve a problem faced by a certain segment of users. The delivered benefits and the value obtained from them must be large enough (and to a sizeable set of paying customers) that the amount buyers are willing to pay for the product will create a sufficient revenue stream to, at least, offset your expenses and profit goals – following a planned break-even period. That extremely simple (but extremely important) concept outlined above – IS often overlooked not just in startups but also in million dollar budget environments! an estimation of the value delivered to them. But it goes way beyond that foundation. Products, (even the newest, greatest, most unique invention!) have to vie for attention among other competing products and alternatives. That is where differentiation and positioning come into play. To effectively differentiate (highlight the superiority of your product vs. your competitor’s products), strategic product managers look beyond product features / core capabilities to additional product-related aspects that the customer does (or can be educated to) care about. Another key aspect is your brand positioning. How your customers view your products not only on functional / measurable parameters (differentiation), but also how they view your brand on a matrix that includes intangible / emotional / psychological dimensions? The bottom line is whether your target customer segments understand how your products & services are comparable or superior to offerings from your competitors. More on this on the branding strategy 101 page. You also have to factor in variations in customer processes for evaluation, trial, decision, purchase, usage. Products also have to work well with other related products and existing processes in the customer’s operating environment. Considering these aspects can raise pertinent questions, stimulate insights, and generate innovative ideas for ongoing enhancements to your product design. Well, not so much the company as the concept of whole grains versus the inner kernel! We come to another often overlooked angle / concept that can deliver great value to your marketing innovation efforts – the concept of the whole or augmented product versus the core product. Every product has a set of processes associated with them that are almost as critical in winning the customer’s preference, purchase dollars, and later satisfaction with your product and company – as the core product features & capabilities. In some cases, the whole product includes related product offerings that enhance the customer’s overall experience & satisfaction. Successful companies take care to analyze and creatively design these processes and related offerings / privileges – achieving greater marketing results, margins, and ROI. Marketing efforts deliver results when they start with a well designed product. And perhaps more importantly, a well crafted product development process that prioritizes ongoing innovation – looking at all the product strategy levers outlined above. Strategic product management helps a company achieve a sustainable competitive advantage – paving the way for targeted sales, market share, and ongoing growth. When you need an experienced, objective marketing consultant to help you identify – and innovate on – various opportunities to enhance your products and associated processes / offerings, please get in touch! An experienced, strategy & innovation-driven marketing consultant can help you identify opportunities and issues in these critical areas – enhancing your product strategy & communications strategy – vital components of your intelligently architected pursuit of sales, marketing, and business goals. Contact us today to schedule an initial discussion of your business vision, goals, and marketing needs – and how we can start working together productively . Once you appreciate the impact and far-reaching value of these strategic inputs & influences, you can leverage them to create your marketing strategy and plans. On our Strategic Analysis page, you will find concise summaries of the 4 types of marketing analysis. These conceptual overviews offer insights, tips, and best practices from a high level perspective. Explaining how these strategic marketing analysis tasks provide the necessary inputs for creating online marketing strategies and plans. They highlight the key challenges in each business analysis area as well as the significant opportunities for smart growth. When you are ready to create a winning online marketing strategy with an objective guide & sounding board; a sharp, creative thinker & marketing strategist; a reliable professional to partner with you to enhance or overhaul your brand, messaging, and product innovation efforts, please get in touch! As well as SMB, small business, entrepreneurial startups.